This 4 bedroom villa offers a rare taste of traditional Balinese luxury. The villa sits on the banks of a small lagoon, where the river meets the sea, with over 100 metres of private beach frontage overlooking one of Canggu’s infamous surf breaks. 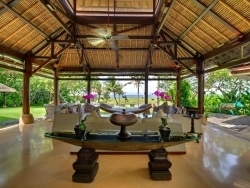 This 6 bedroom villa offers a rare taste of traditional Balinese luxury. The villa sits on the banks of a small lagoon, where the river meets the sea, with over 100 metres of private beach frontage overlooking one of Canggu’s infamous surf breaks. Set within lush tropical gardens and surrounded by rice fields and farming communities, this 5 bedroom villa is a ten- minute stroll from Canggu Beach, renowned for its excellent surfing and spectacular sunsets.